The Pullo Center at Penn State York welcomes Craig Wayne Boyd to its stage on Thursday, June 18, 2015, at 7:30 p.m. Ticket prices are $45 and $30, and go on sale February 27 at 10:00 a.m. Members can order now. Tickets can be purchased at The Pullo Center Box Office, charge by phone at 717-505-8900, or online at ThePulloCenter.com. 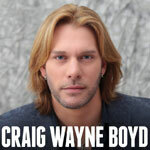 Texas-born and raised country singer and multi-instrumentalist Craig Wayne Boyd, who came to the public's attention when he was a contestant, and the eventual winner, on the seventh season of the television show The Voice in 2014, showed an affinity for music even as a child. Growing up in the Dallas, Texas suburb of Mesquite, he was drawn to gospel and country, and was active in his church choir, eventually becoming its director. He moved to Nashville to try for his dream of a career in the music business in the early 2000’s, and soon had a publishing deal with EMI. Things looked promising. Yet Boyd, after ten years of songwriting, local gigs, national support touring, and trying everything he could to further that dream in Nashville, was on the verge of quitting music because of financial and other pressures. All that changed when he auditioned for the seventh season of The Voice. Ending up on Blake Shelton's team, Boyd's singing voice, playing, and easy musical versatility made him a fan favorite, and eventually made him the overall winner.